These chocolate covered seeds and nuts are guaranteed to be gluten free, peanut free, made in USA and kosher. Our Sunflower Seeds and Candied Corn Kernels are simply delicious; they are freshly roasted, lightly salted and coated with cocoa, then topped off with a thin colorful sugar shell. 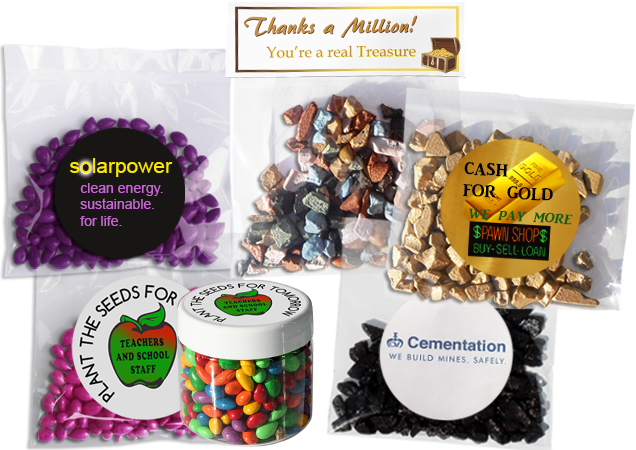 Order these premium bulk products by the ounce in the packaging of your choice - from customized clear cello bags to plastic, acrylic or glass containers. 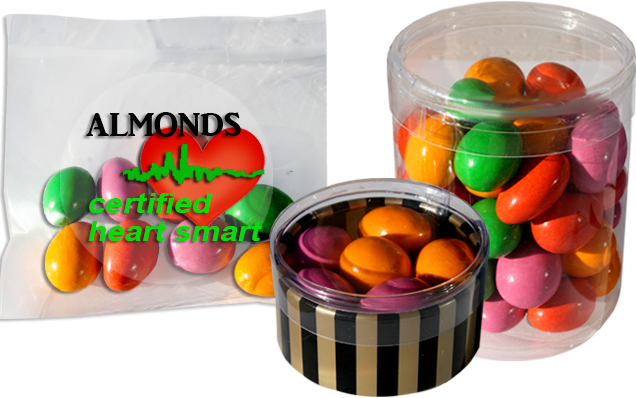 • Find out about candy in Glass & Acrylic Containers, check our container samples. • For a complete list of our Chocolate Rocks, click here. • View the list of our selection of Bulk Candy Fills on our Fills page. We also feature 35 different flavors of chocolate covered Gourmet Almonds, as well as Dates, Pistachio Nuts and Espresso Beans. and finished off with a thin colorful sugar shell that seals in freshness. Depicted to the right are chocolate covered Spring Mix almonds in poly containers and cello bag.